Bottle to pint. Looks good; burnt-orange with nice head. Smells Pretty average. This might be an old bottle though; hard to tell without a date. Tastes slightly better than average, but that’s not saying much. 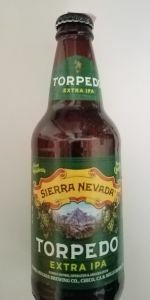 I hope it’s an old bottle... Sierra Nevada Pale Ale is MUCH better than this - and I prefer IPAs. Mouthfeel is average. Overall, nothing special - at all. The only way I’ll drink this again is if somebody buys it for me - before I can stop them.